For the 2017 model year, Kia widens the availability of many Optima packages, adds features to some packages, and includes more features as standard for the two top trims, SX and SXL. We have many great deals for customers in Staunton VA, Waynesboro VA, and Charlottesville VA. If you need help with a car loan for a new Kia Optima, we got you covered. Get approved today! 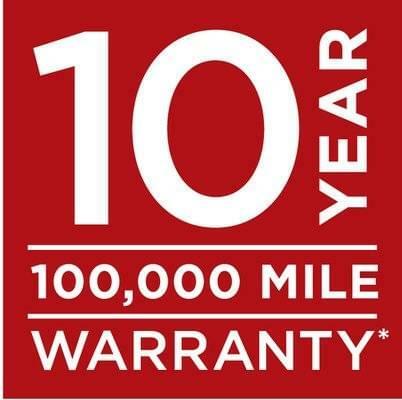 All new Kia owners are given the 10 year 100,000 mile warranty. 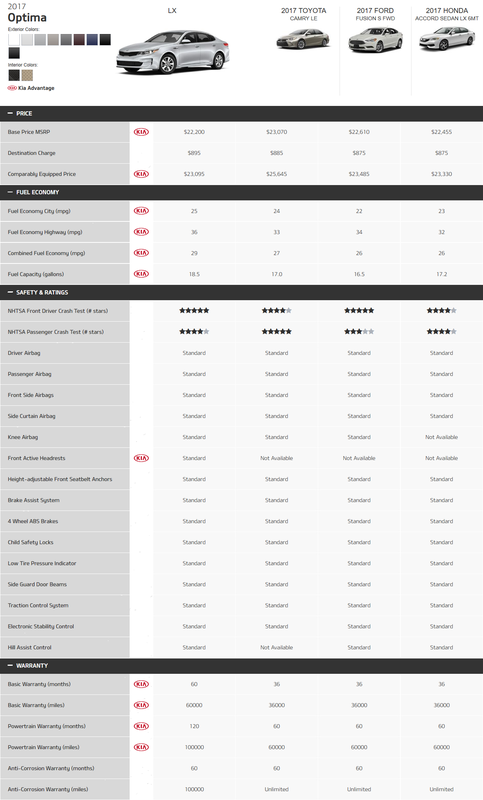 This is a great piece of mind when shopping for a new Kia Optima. The 2017 Kia Optima sedan is equipped with a standard 2.4-liter I-4 that produces 185 hp and 178 lb-ft of torque and paired to a six-speed automatic that delivers an EPA-rated 25/36 mpg city/highway for the base LX trim and 24/34 for the EX trim. The optional and fuel efficient 178-hp, 195 lb-ft of torque 1.6-liter turbocharged I-4 is mated to a seven-speed dual-clutch automatic transmission and delivers 28/37 mpg, but can only be equipped in the EX trim. The most powerful engine, a 2.0-liter turbocharged I-4 that produces 245 hp and 260 lb-ft of torque (also mated to a six-speed automatic), manages to deliver 22/31 mpg and is available in the SX and SXL trims. Beyond those three gas engines, the 2017 Kia Optima is available as a hybrid and plug-in hybrid. The 2017 Optima Hybrid manages to deliver an impressive 39/42 mpg while the Optima plug-in hybrid electric vehicle can run up to 29 miles on all-electric energy and has a combined fuel economy rating of 40 mpg. If you decide to purchase the mid-level EX trim, the EX Premium package becomes available and includes a panoramic sunroof with power sunshade, an 8-inch touchscreen with Uvo Eservices and navigation, 10-way power adjustable front passenger seat, ventilated front seats, LED interior lighting, blind-spot monitoring, rear parking sensors, Rear Cross-Traffic Alert, and an auto dimming rear-view mirror. The SX trim’s Launch Edition package includes everything above but adds Merlot color sport leather seating, a Harman/Kardon premium surround-sound system, satin chrome accents, and heated rear seats. 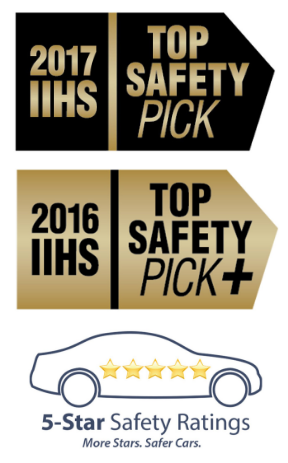 The 2017 Kia Optima was awarded the highest overall rating of five stars by the NHTSA, the sedan received five stars in three crash tests conducted so far: front, side, and rollover. The Kia Optima is a 2017 Top Safety Pick for achieving the institution’s highest rating of Good in all crash tests conducted including the difficult small overlap front crash test. The Optima also received the IIHS’ highest rating of Superior for front crash prevention by avoiding a low-speed 12 mph collision and a high-speed 25 mph collision using automatic braking. To take advantage of this, you must opt for the Autonomous Emergency Braking feature in the SX Technology package or find that feature standard in the SXL trim. Additional safety features include rear parking sensors, Blind-Spot Detection system, rear cross-traffic alert, adaptive cruise control, forward collision warning, and a lane departure warning system. The Kia Optima plug-in hybrid is more than 500 pounds heavier than the base SX model. However, the sedan still delivers a combined city/highway fuel economy rating of 40 mpg versus the SX’s 29 mpg and can run on all-electric power thanks to its hybrid powertrain.